The Library is named for alumna Noreen Reale Falcone, class of 1958. Noreen Falcone of Skaneateles, NY is a former Regent and Trustee of Le Moyne College who maintains close ties to the College. She is a community leader in the Syracuse area and beyond having served in a variety of non-profit humanitarian efforts. She is a member of the Order of Malta and served in 2008 as President of the U.S. Federal Association. The Noreen Reale Falcone Library has been in operation since the College began in 1946. At that time it was housed in Le Moyne Hall on 254 East Onondaga Street along with the first classroom and the first headquarters for Le Moyne College. Through the efforts of Rev. Andrew L. Bouwhuis, S.J., the nucleus of the Library was formed with 5,000 volumes. The Library has been in its new location at the southwest corner of the campus since September 1981. It was named for alumna Noreen Reale Falcone in 1998. 1946 College founded. Library located at Le Moyne Hall. First librarian appointed--M. Catherine Kenna. 1947 Rev. Theodore J. Cunnion, S.J. appointed Library Director. 1948 Library moves into second floor of the new Administration Building (presently Grewen Hall). 1960 Rev. Andrew L. Bouwhuis, S.J. appointed Library Director. Over 40,000 volumes contained in collections. 1963 Dr. Taisto J. Niemi appointed Library Director. Library obtains former cafeteria on first floor of Grewen Hall for more space. 1970 Library acquires three classrooms in Grewen Hall. Library increases holdings to 98,402 volumes. 1976 Joins OCLC Network (Online Computer Library Center) computer terminal to this system installed. 1979 New library site dedicated June 14. 1980 Groundbreaking ceremonies held April 22. Construction begins on new Library. 1981 Library moved to 250,000-volume capactity building in August. Sadly, Dr. Niemi who dreamed and planned for the new library for many years, passes away two months after the Library opens. 1987 Professional staff expands from 4 to 5 librarians. 1994 Professional staff expands from 5 to 6. Automated library system installed. 1996 First floor renovation provides for Academic Support Center’s move to the Library, adds multimedia lab, offices, and consolidates public services. 1997 Theresa Santillo retires after 45 years as Assistant to the Director of the Library. Student service award in her name established. 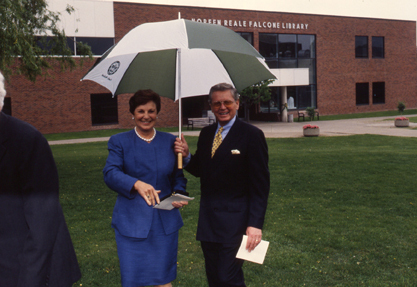 1998 Noreen Reale Falcone Library is dedicated on May 9 in honor of alumna Noreen Falcone. Gift of the Michael J. Falcone Family. 2000 Tatyana V. Popovic Memorial Archives and Special Collection is built with funds donated by Gina (Popovic) and Robert Goldhammer. 2001 Muserlian Instructional Lab is constructed on the first floor. Gift of Theodora Muserlian in honor of Peter Muserlian. 2003 Wireless computer network installed. Library print collections near capactiy. Back-volumes of print journals withdrawn in favor of JSTOR facsimilie back-volume service. 2008 Information Technology Help Desk moves to the Library in May. 2012 Reorganization of public services and establishment of a single service desk. Education collections moved to second floor.Library enters patron-driven acquisition plan with ConnectNY Consortium E-book Project with EBL company. 2013 First floor reconfiguration completed by removing reference desk and office, adding 3 media viewing rooms & group study areas. Library joins ConnectNY Print Trust to begin to compare and assess cooperative retention of print monographs. Renovation, phase 1, construction of the Quantitative Reasoning Center, a Writing Center, and a renovated Student Success Center, along with renovated library staff offices, relocating technical services and the offices for Academic Technology. Renovation, phase 2, remodels the remaining areas of the first floor (library and IT service desks, Disability Services), moving the Muserlian lab to the second floor and the Bernat Room to the rear of the first floor.